Last Sept the local paper was kind enough to cover my endeavours at the Duathlon World Championships in Rimini – I was so proud of my page 3 status! I bought loads of copies and gave them to all and sundry, including my doctor, who showed the article to several patients, using me as an example of what could be achieved if one put one's mind to it! He told me that many had seen the article and some had seen me about town (on my bike, in my GB tracksuit!) and it dawned on them that I was a real person, not just someone you read about in the papers! Two or three had actually gone out and bought bikes, their resolve to overcome health or weight problems galvanised by seeing my article in the paper! How good is that! Doing something to improve my health is one thing, but inspiring others to do the same is really special! I told my doctor that at my next appointment I would show him my medal! That was my dream – a podium finish and to win a medal for my country – and I was confident I would do it, too! I also wanted him to be proud of me, knowing how unfit and overweight I had been just a couple of years ago, and was really pulled by the idea that I could inspire more people to do something for themselves. Just to remind you, duathlon is a 10k run followed by 40k bike, then another 5k run – and I'm still not much good at running! So, on Easter Monday I went to Steyning near the south coast and managed to overcome the first hurdle by qualifying for the ETU Duathlon European Championships, which took place in Budapest on 24th May. A week before the race they published the start list for my race. I did a little research and discovered that I was up against some pretty stiff opposition! Of the ten in my age group, at least three (the Italian, the Austrian and the German) had all sorts of national titles and top world rankings to their names, and were significantly faster than me – by at least 10 or 20 minutes – too much for me to overhaul! I realised that, unless one or more of them suffered some misfortune (like a puncture – happens to the best of us! ), I stood no chance of beating them. As for the other six, they were mostly Hungarian but I could find out nothing about their form... So, the very best I could hope for was 4th place... and I would give it my very best shot! I've never been to Budapest before. I travelled out on my own and decided to stay in the TeamGB hotel which was a good move because everyone was fantastic – fellow competitors and organisers alike – and the atmosphere was brilliant, mostly down to Joan Lennon, the TeamGB age group manager. The venue was in Buda, right on the western bank of the Danube, just south of the picturesque hilly outcrop of the Citadelle and famous Hotel Gellért with its natural hot spring baths. Both the run and bike course were along the banks of the river, fairly flat but exposed. Race day dawned – cloudy but warm and dry, with a breeze to cool you down a bit on the run but also enough to hold you back on the bike! Boy, there were some fancy bikes there! I thought mine was a nice bike, but virtually all the others were the most amazing time trial bikes with very whizzy wheels… mine just had tri-bars screwed on! Time chips checked and secured to my ankle, and finally we’re off! I really struggled on the first 10k run but even so managed to overtake a few Hungarians in my category! It went on for an age but at last I finished running and entered transition where I had to change from being a runner to a cyclist – I've been practicing in my hall, and managed to make what felt like a seamless switch, and at last was off on the road with my bike! I can’t explain why but my legs immediately forgot all about the hard run and got right down to business of pushing the pedals round… I loved it! After one and a half of the four 10k laps I had overtaken another two Hungarians and a Slovakian, who had really given me the eyeball on the startline as if to say 'You won't catch me, Jimmy!' (she looked Glaswegian!). ‘Yes!’ I thought as I eased past her… I nearly punched the air! I could have ridden my bike all day – I felt very strong as I carved my way through a field of faster runners of all ages – some seemed as if they were going backwards! Later on, the sophisticated race timing system confirmed that I was getting faster with each lap! Sadly, all good things must end, and before I knew it I had to dismount, park my bike and helmet, and put my running shoes on again. The only thing that spurred me on was the knowledge that I’m not a quitter, plus I believed there were now only three girls in my category ahead of me, but I couldn’t be sure, nor did I know how far behind the others were! 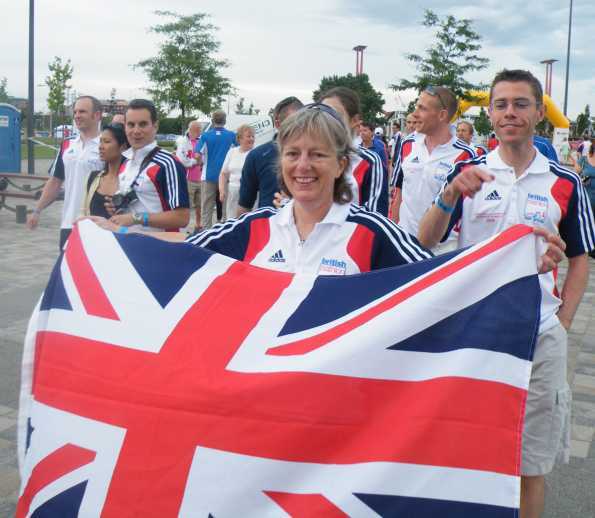 TeamGB was one of 32 nations present and comprised just over 100 of the 650 competitors (apparently it was the largest European Duathlon ever), so there was plenty of patriotic support out there for everyone… One chap yelled ‘Come on Ann, keep going, you’re looking great! And there’s no-one in sight behind you!’ Oh, music to my ears, no-one behind, I’m not about to be caught by the Slovakian! Near the finish line everyone was cheering and I could hear the bi-lingual commentator, he said my name, then I heard him say I was finishing 4th in my age group, and I couldn’t believe it! Someone handed me a flag and I crossed that line as if I had won the race! I have never been more exhausted, but that feeling soon passes and is replaced with a sense of euphoria and satisfaction in the knowledge that I had done what I had set out to do – to do my best. As for me, I was absolutely delighted because the medal winners didn’t beat me by as much as they should have done, and I took more than six minutes off my best time to finish in 2hours 32mins! My running is relatively poor, but on the bike I came second in my race, beaten only by the Gold medal ex-professional cyclist! The bike leg actually measured 41k, and it took me 1hr 15mins, so an average of just over 20mph. Later on I learned that I came 24th on bike out of everyone – more than 100 girls, all ages – so I’m pretty pleased, not bad for an old bird! Overall, TeamGB (age group) won fistfuls of medals, 22 in all and mostly Gold, as well as two more Golds the day before for the Elite Female and Junior Female categories, so all in all an excellent week-end’s work! And my next goal? To beat 2 hours 30… and to inspire more people to get fit and healthy!